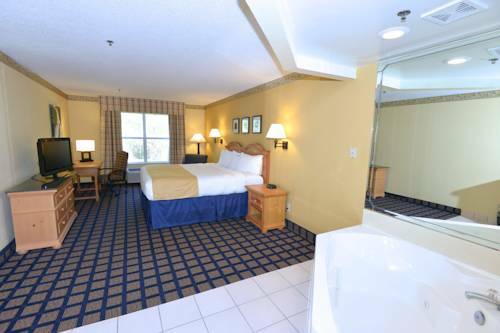 Country Inn and Suites is one of the finest hotels in Lake City. It is located in close proximity to I-75 and major attractions, including the world famous Ichetucknee and Ginnie Springs. Hotel offers wired/ wireless high speed internet throughout the hotel, Hot " Be our Guest" breakfast bar, served on dining ware with a rotating menu, state of the Art Fitness Center, indoor heated pool, guest laundry. All rooms offer a refrigerator, microwave, coffeemaker, hairdryer, iron and iron board, electronic safe, 32" TV with HBO. Two-Room Suites: These suites feature a king bed, two televisions and two telephones. The spacious Living area also includes a sleeper sofa. For lunch and dinner, our Lake City hotel's location is near many restaurants. We recommend the following: Texas Roadhouse, Applebee's, Gondolier Italian Restaurant, Cracker Barrel, Mike's Cafe & Grill, Red Lobster, Cedar River Seafood.